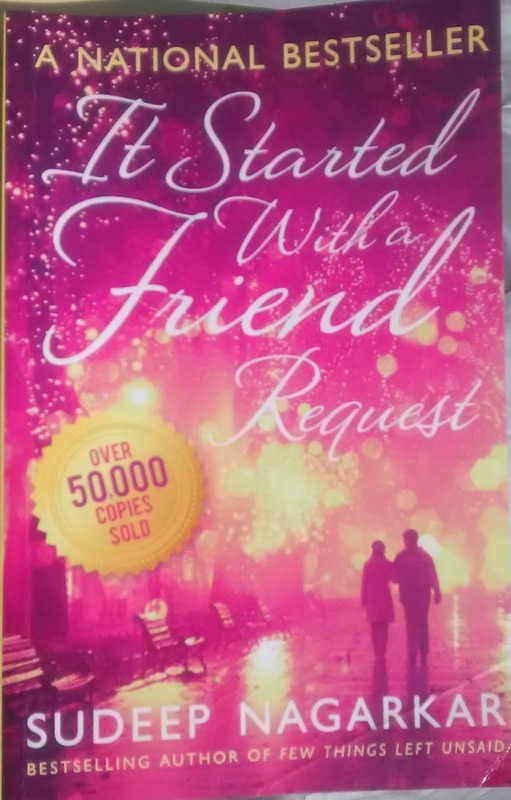 "It started with a friend request" is a romance novel by Sudeep Nagarkar. I had bought it few months ago on flipkart but finished reading it only recently. The 209 page long novel has two parallel love stories, which merge tactically in the end. It is pretty straight forward and keeps interest on. Reading this novel helps you understand complexities of office relationships when your boss/subordinate is of opposite gender. Most of the initial pages sound like typical love stories, it is only in the last part where author skilfully merges two tracks into one to take the story to a logical conclusion. The title seemed to suggest it all started with a facebook friend request- but there's hardly any mention of facebook in the novel. It started with Blackberry PIN exchange and then telephone number exchange. And there's reference to what'sApp conversations. In summary it is a short and straight romance fiction, worth your time if you have half a day of free time to read something.